Well in terms of the resolution this is a bit dodgy … I was in Cologne for two hours and Prague for six, both waiting to change trains on my way east across Europe. I had been trying to avoid journeys where I had to change but they were never that stressful, everything went remarkably smoothly because European stations seem a bit better laid out and have better signage than over here. 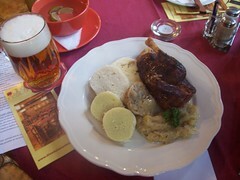 Two hours in Cologne really only gave me time to grab a bite to eat and drink a few glasses of Kölsch. 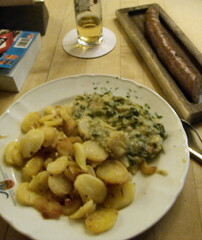 The beer is good, the sausage was alright but together everything was salty to the point of almost being inedible. Although I did have a bit of a hangover at this point so I wasn’t in the best position to judge. It was too dark to get decent pictures of anything else, I should have got an earlier train and then I’d have had time to see the Cathedral which is right beside the train station. Although then it would look like I’m travelling the EU visiting cathedrals, which I’m really not — I just have a thing for Gothic architecture. I was meant to have a day and an evening in Prague but I’d decided not to do two back to back overnight train journeys and so I changed my ongoing train to an earlier one. The hours in Prague really only gave me time for a bit of a walk about and some more food (well, it’s a fair old journey overnight from Cologne). So, it’s a bit dodgy, I’ve been to both Germany and the Czech Repubilc before and I’ll certainly go back to both but if I end up visiting every other EU country in 2008 except one or both of these two then I’m going to go ahead and count ’em. This entry was posted on Wednesday, March 19th, 2008 at 9:52 am	and is filed under Life, Photo, Travel. You can follow any responses to this entry through the RSS 2.0 feed. Both comments and pings are currently closed.